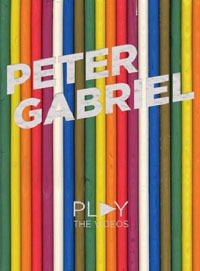 Share the post "DVD review: PETER GABRIEL – Play The Videos"
Peter Gabriel completists may wonder at the re-release of video hits collection. It first surfaced in 2004 and was included as an ‘extra’ with the Live in Athens Bluray release. So, what’s new? Well, nothing actually. So far as I can ascertain, it’s just a straight re-issue. Gabriel has always been ‘cutting edge’ and the original project to restore these 23 videos, left no technological stone unturned. Undertaken in house at Real World the best source videos were tracked down – in the case of Sledgehammer recreating a new hi-definition master – and cleaning up many frame by frame. To supplement the restored footage, Daniel Lanois created 5.1 mixes filled out the soundstage for the ultimate listening experience. If you’ve got the necessary equipment. And it didn’t end there, each video was given a short introduction which can be turned on or off on the main menu, and there’s trailers for ‘Growing Up Live’, ‘A Family Portrait’, and ‘Secret World Live’ as well as a novel programmable feature which lets you create your own playlist of up to 18 of the videos that you can be loop (although quite why you’d want to …). The content really needs no introduction – you get all the hits from Solsbury Hill (1977) to The Barry Williams Show in 2002 and pretty much everything in between. Cutting edge at the time, many now seem a little visually dated in the era of CGI. This entry was posted in All Posts, DVD REVIEWS and tagged Bluray, DVD, Peter Gabriel, Play The Videos, review, video. Bookmark the permalink.